Today we are happy to offer this Jewish Wedding Rabbi interview with Rabbi Andrea Frank from Jewish Wedding Rabbi. 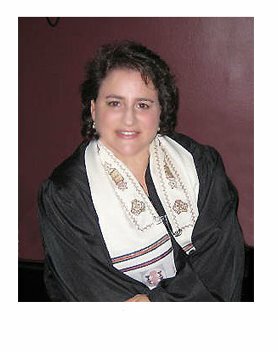 Rabbi Andrea is an Ordained Reform Rabbi who officiates weddings, baby naming and life cycle ceremonies in the New York Metro area. 1. Rabbi Andrea, please take a moment to briefly introduce yourself and tell us more about your website, Jewish Wedding Rabbi, and the services you offer. Rabbi Andrea Frank, I am an Ordained Reform Rabbi. I officiate weddings, baby naming and life cycle ceremonies of the Jewish faith. The Jewish Wedding Rabbi website offers resources of information to learn about the Jewish Wedding for couples who are both Jewish and for interfaith couples where one partner is Jewish making that commitment to have one faith in their marriage and home. My web site is set up to educate all couples on the Jewish wedding ceremony customs and rituals. It lets a couple feel connected to tradition of over 2,000 years ago from generation to generation even if for the modern couple. Serving the tri-state area (NY/CT/NJ). 2. How long have you been a Rabbi, and what led you to becoming a Rabbi? There was no one specific moment that spoke to me to become a Rabbi. It was more of a process, a path of life that led me in this direction. It also helped to have known that my Great Grandfather on my mother’s side was Kohanim, part of the priestly tribe and all his father’s before him. They were the tribe of the Jewish people who conducted the rituals and customs. The title Rabbi came later on. So, I guess you can say, it was meant to be. 3. You recently performed a ceremony for a destination wedding in France. That must have been a great experience. Please tell us a little bit about that experience and any other destination wedding ceremonies you have performed. The actual wedding took place in the countryside of France outside the city of Paris. This was a lifetime experience for one whom has never visited the country France. The history, the architecture made the visit a delight. The Jewish wedding ceremony took place in the backyard of the bride’s parents Chateau. This was no ordinary backyard like we know here in the states. It had sprawling hills and views of the countryside beyond the eye could see. It was a beautiful back drop for a wedding with the beautiful Chuppah raised and for the couple to receive their marriage blessings in their sacred space surrounded by the beauty of God’s creations. Whether I travel near or far, the locations are often beautiful, but it is the glow of the love I see in the faces of my couples as I officiate their beautiful wedding ceremonies under the Chuppah. 4. What is the best advice can you give couples that are planning their wedding? The best advice is to not stress over the details and to focus on what the whole day is all about, the binding of two hearts into one, your marriage. The details are what make the day beautiful, but if you had no material items, what is left, the love that binds you both. 5. What are some things that a couple should look for when choosing a Rabbi for their wedding ceremony? When choosing a Rabbi, the most important part of the search is “Do you Connect.” You want a Rabbi who listens and who will guide you, the couple through the process. That is how my web site came about. The definition of a Rabbi is teacher. I have the opportunity to teach by building pages on my web site that speak to those searching for information on the internet for their Jewish wedding ceremony and or life cycle ceremonies. 6. On your website you offer many articles about Jewish weddings, great advice for couples who are planning a wedding and even a virtual classroom for Bat Mitzvah and Bar Mitzvah lessons. Do you have plans to further expand your website or to offer additional services in the future? I’ve discovered more and more there is always room to create more pages to assist others. I have yet to put up a page for Renewal of Wedding Vows. This would be for couples whom are married from a few years to fifty years. Depending on the circumstances of their first wedding ceremony, they might not have had the opportunity to be blessed under a Chuppah or have had the wedding day of their dreams, but now could. Then for those couples, whom love each other so much, a renewal is just what they are looking for. I have recently added interactive pages, meaning, a person can post a personal experience on any or all the pages on my web sites. They can share their wedding ideas, wedding memories, baby stories and even those heartfelt memories of a beloved whom has past. It does not matter how many years it has been. In Judaism, the memory of a beloved whom has passed is kept alive within us. Posting that person’s name and a little about them keeps their spirit alive and shared with others to know a little about them. The internet has evolved in more than a searching tool. It can provide comfort; it can provide wedding ideas for other couples, providing a service to find a Rabbi for a life cycle ceremony that once was too difficult for the unaffiliated. The opportunity for our couples and families whom happen to not belong to a community within a temple congregation can in fact continue to honor Judaism customs and not be turned away because they are not a member. We are all members of a community and the internet offers just that, you just have to use it to make it work for you. Social networking has become the latest thing to do, but being able to reach beyond the computer to fulfill a tradition that you grew up with, is priceless.